Iron chef is the most favorite cooking show that even not only me, my baby also loves it. While she always like watching Alton Brown’s kitchen show every evening, I love Mario Batali’s recipe. He has a cooking talent that no other chef does though he looks a “little corpulent”. This recipe is so great that I gained 2 pounds in a week by over eating this pasta everyday. Only modification here is that I used fresh fettucine in place of packaged pasta. That makes a significant change to your taste. I promise you. – Mix the flour with 3 eggs for 5 minutes. Knead the dough for 5 more minutes until eggs and flour incorporate. If you have food processor, it’s gonna be easier by using the dough blade to knead the dough until it’s roughly incorporated. – Roll the dough until it’s 2 mm (or 1/8 inch) thick. Cut the dough by 5mm (1/4 inch) width. If you have pasta machine, just do it by the manufacturer’s instruction. 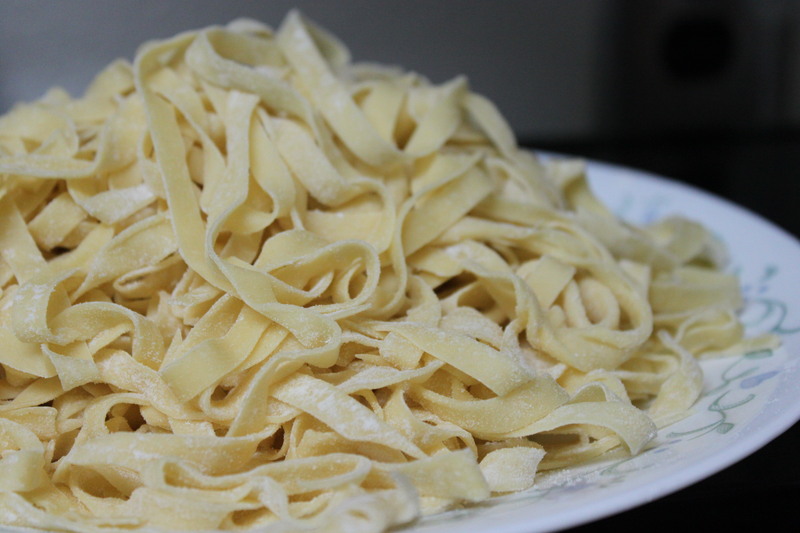 – Boiling the fresh fettucine in a boiling water for 3 minutes. It’s quickly cooked so that you should be careful about the boiling time. Reserve 1/2 cup pasta water for adding to the sauce. – Add the cooked fresh fettucine and mix well. Slowly add more pasta water to the pasta to thin the sauce. 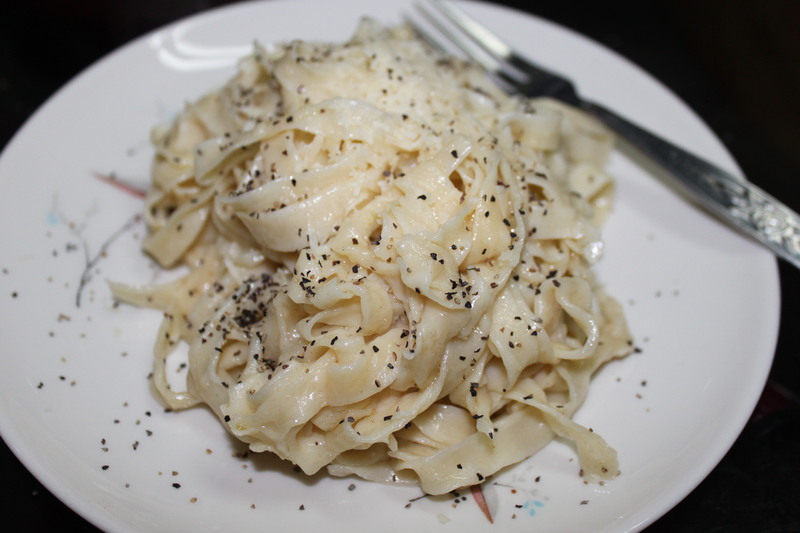 – Add the ground the black pepper and you finish the pasta. You can add more salt to your taste but be cautious, the Romano cheese is really salty. For me salt is never needed. This entry was posted in Italian, noodle, pasta and tagged cheese, Italian, pasta. Bookmark the permalink.